The transcendental wonders of the Enlightenment Transmission Retreat beamed direct to you. For the first time ever we will intentionally meet in Consciousness in the Transcendental Realm of Enlightenment Transmission during this online Intensive something that usually is only possible on residential 7-day Enlightenment Transmission Retreats. Also for the first time ever you will have the option of live video watching and the possibility of eye-to-eye contact through webcam. Read exciting feedback from Intensive experiencers. This Intensive will have a transcendental quality. I hope that you become fully conscious of this transcendental essence as it will anyway affect you for many weeks to come. On Retreats the Transcendental Realm co-exists with the external natural world. It’s like we meet in an exalted protective bubble of wisdom, light and freedom that floats above the island. Wherever we go and wherever we look we see and feel this Transcendental Realm. The Transcendental Realm is the place of Enlightenment Transmission activity. It is here that the Beingness of Enlightenment Transmission moves and is experienced. The effects of Enlightenment Transmission trickle down into the mind, body and everyday life. 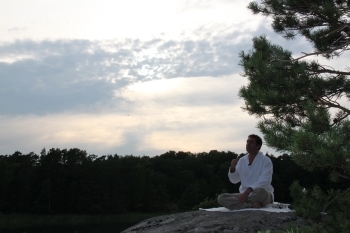 The Transcendental Realm of Enlightenment Transmission is most noticeable in the natural surroundings and delightful, revelatory interactions that we have on 7-day Enlightenment Transmission Island Retreats and is akin to Heaven. This Intensive aims to replicate the feel and effects of an Enlightenment Transmission Retreats. This is a revolutionary, unmissable opportunity that can help those who are either considering, preparing for or else unable to attend an Enlightenment Transmission Island Retreat. Everyone can and will benefit by attending this Intensive.